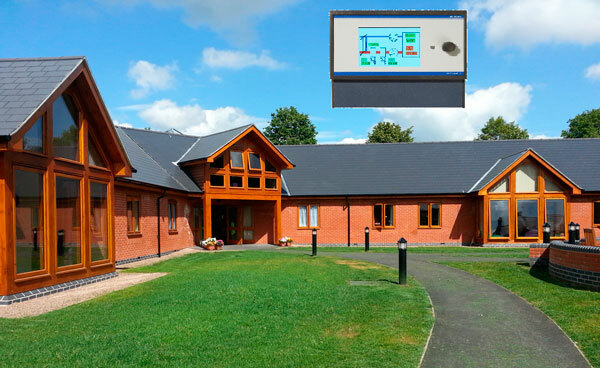 We have recently completed the Stanley House / Bowley Court residential care home project in Herefordshire. This was done in partnership with Steve Wedgebury (Stewart Associates) and Evesham Mechanical Services. The scope of the project was to provide a modern controls system with ease of use for the customer, to realise this we chose to integrate the Elesta BMS system with its embedded web browser capabilities. The flexibility of the Elesta control system as well as using standard I/O Modules and supporting multiple protocols made it the ideal solution. The existing plant room is detached from the main building Stanley House and the new extension Bowley Court. Its control is achieved using the C2 BIU (BACnet Interface Unit) controllers over the BACnet MS/TP Comms controlled from the Elesta RCO 720 DW main controller located in the new plant room panel. The plant room consists of a Biomass boiler as the primary heat source with oil fired boilers as back up as well as buffer vessels and change over valves for the bio / oil boiler selection. This provides heat to the existing Stanley House and its DHWS as well as the new plant room in the Bowley Court extension. The new plant room consists of UFH to the numerous newly built residential care rooms and the DHWS. The Elesta system offers the end user easy access through its twist and click LCD interface and also offers the flexibility of access via web e.g. internet explorer. This gives the customer access to the schedules / room temp settings / DHWS settings / temperature logs / DHWS temp logs etc. The Elesta controller also provides the facility for daily report – e-mails on temperatures / schedule status / alarms etc.